This page describes how to enable multilingual support in your application. When syncing content with your application you call syncRemoteContextsAsynchronously on iOS or syncRemoteContextsAsynchronouslyWithPriors on Android, passing nil/null instead of a list of priors loads all contents available. Consider “priors” as filters for synchronizing only certain contents. To enable multilingual you need to add the desired language tag to the list of priors. Tags are basically filters for the contents. Loading content with a tag means that only the contents marked with the specified tag will be loaded. 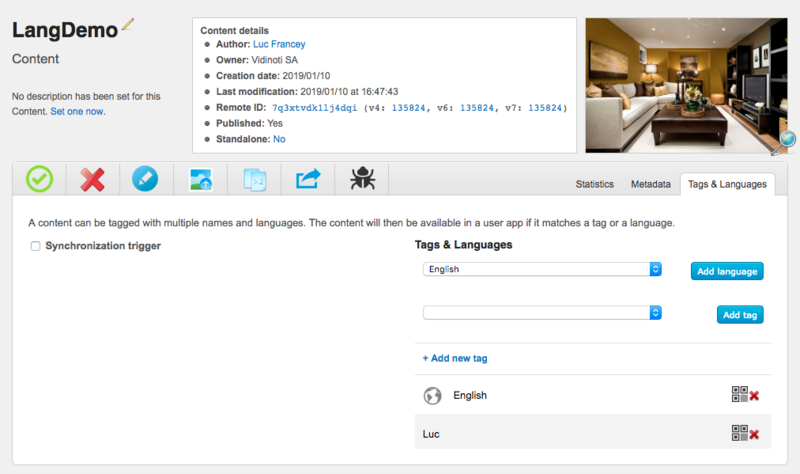 Since this is just what we want, we can use tag to filter contents by language. A little bit further in this page you will see how to add language tag in V-Director. In the meantime, you can find a language using a string representation containing the prefix “lang_” and the suffix corresponding to the ISO 639-1 code of the language. The first thing to do is to find the language used by the phone in your application. Now that you have the tag corresponding to language used by the phone, you can call syncRemoteContextsAsynchronously on iOS or syncRemoteContextsAsynchronouslyWithPriors on Android with a list of priors. Adding a VDARIntersectionPrior will act as a logical AND, so the content must have all tags to be loaded. For example if you want to load all the content tagged as “best_ar_content” AND “lang_en”, you need to add both tags to the list of priors within a VDARIntersectionPrior. You are almost done ! You just need to enable 2 more features in V-Director and assign tags to your content. Go in SDK>SDK Settings and check “Enable multilingual support”. Here you can add any language you want to support, the tag generated by the lang you select is described in the Tags section. First you need to go in My Contents>Content list, then to assign a tag to content you have two ways : edit the content or drag and drop the image of the content on the tag. Drag the image and drop it on the desired tag. Go to SDK>My Applications, edit your application to check “Use tag management system”. WARNING: if your application is already in production you should update your application before checking this ! When you check “Use tag management system” and only when it’s checked, your application will apply the priors list when synchronizing (i.e. contents will be filtered). When it is unchecked your system does not care about the priors list and synchronizes all contents (independently of their tags). This means that if you update your code and add multilingual support after releasing your application everyone that has the version without multilingual won’t have access to any content. What you should do instead is : update your application with multilingual support, leave time for people to update your application and then check “Use tag management system”.